Who Is Frances Glessner Lee? rances Glessner Lee was born to a wealthy family in 1878. As the daughter of the co-founder of the International Harvester Company, her life was meant to be an unperturbed existence of needlework, embroidery, interior design and marriage. As kids, Lee and her brother were home schooled, but while he went on to Harvard, she was pressured to marry at the age of 19. Throughout her marriage and eventual motherhood (she had three children), Lee harbored a desire to pursue an unlikely career: forensics. She’d shared this desire with some friends, who remained cynical and dismissive of her very specific ambitions. Following her divorce and the death of her brother, a 52-year-old Lee finally opted to pursue her interest anyway. And she did so unreservedly. In 1931, with the family fortune now in her name, Lee used her hefty inheritance to wedge her way into the world of forensics. First, she established the Department of Legal Medicine at Harvard, the first program of its kind in the country. Three years later, she gifted the department a collection of books and manuscripts that would one day become the Magrath Library of Legal Medicine. By 1936, she’d donated another $250,000 approximately $4,400,000 today, accounting for inflation to the program. Lee’s financial generosity helped her get a foot in the door of the burgeoning forensics field, but her prodigious knowledge and unorthodox skills ultimately propelled her to become, without any formal training or a college degree, the first female captain of the New Hampshire State Police. (Her title is sometimes listed as “honorary.”) There, Lee also served as the police department’s director of education, leading seminars and training programs for New Hampshire officers. This is around the time she took up diorama. What is the Nutshell Study Of Unexplained Death? 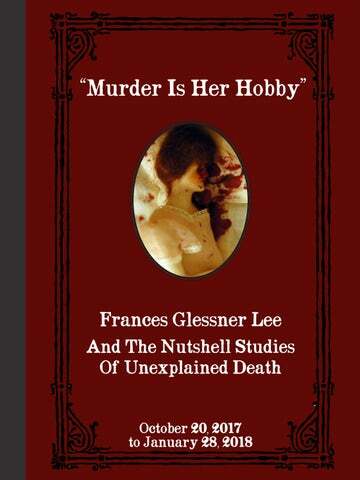 urder Is Her Hobby: Frances Glessner Lee and The Nutshell Studies of Unexplained Death explores the surprising intersection between craft and forensic science. It also tells the story of how a woman co-opted traditionally feminine crafts to advance the male-dominated field of police investigation and to establish herself as one of its leading voices. Frances Glessner Lee (1878-1962) crafted her extraordinary “Nutshell Studies of Unexplained Death” exquisitely detailed miniature crime scenes—to train homicide investigators to “convict the guilty, clear the innocent, and find the truth in a nutshell.” These doll house-sized dioramas of true crimes, created in the first half of the 20th century and still used in forensic training today, helped to revolutionize the emerging field of homicide investigation. Lee, the first female police captain in the U.S., is considered the “mother of forensic science” and helped to found the first-of-its kind Department of Legal Medicine at Harvard University when the field of forensics was in its infancy. At the time, there was very little training for investigators, meaning that they often overlooked or mishandled key evidence, or irrevocably tampered with crime scenes. Few had any medical training that would allow them to determine cause of death. As Lee and her colleagues at Harvard worked to change this, tools were needed to help trainees scientifically approach their search for truth. Lee was a talented artist as well as criminologist, and used the craft of miniature-making that she had learned as a young girl to solve this problem. She constructed the Nutshells beginning in the 1940s to teach investigators to properly canvass a crime scene to effectively uncover and understand evidence. The equivalent to “virtual reality” in their time, her masterfully crafted dioramas feature handmade objects to render scenes with exacting accuracy and meticulous detail. Every element of the dioramas—from the angle of minuscule bullet holes, the placement of latches on widows, the patterns of blood splatters, and the discoloration of painstakingly painted miniature corpses—challenges trainees’ powers of observation and deduction. The Nutshells are so effective that they are still used in training seminars today at the Office of the Chief Medical Examiner in Baltimore. here were 20 nutshells originally, some single rooms, some entire houses. The bulk, 18, have been at the medical examiner’s office. One was ruined years ago in transit. The last one was discovered in the attic of Lee’s estate and has been on long-term loan to the Bethlehem Heritage Society in New Hampshire. Showcasing the Nutshells at the Renwick allows visitors to appreciate them as works of art and material culture in addition to understanding their importance as forensic tools, and to see Lee’s genius for telling complex stories through the expressive potential of simple materials. While the Nutshells represent composites of real and extremely challenging cases featuring homicides, suicides, and accidental deaths, Lee imagined and designed each setting herself. She was both exacting and highly creative in her pursuit of detail—knitting tiny stocking by hand with straight pins, hand-rolling tiny tobacco-filled cigarettes and burning the ends, writing tiny letters with a single-hair paintbrush, and creating working locks for windows and doors. Lee spent $6,000 to $8,000 to build each one, roughly the cost to construct an actual house at the time. The exhibition also highlights the subtly subversive quality of Lee’s work, especially the way her dioramas challenge the association of femininity with domestic bliss and upend the expected uses for miniature making, sewing, an other crafts considered to be “women’s work.” Also evident is her purposeful focus on society’s “invisible victims,” whose cases she championed. Lee was devoted to the search for truth and justice for everyone, and she often featured victims such as women, the poor, and people living on the fringes of society, whose cases might be overlooked or tainted with prejudice on the part of the investigator. She wanted trainees to recognize and overcome any unconscious biases and to treat each case with rigor, regardless of the victim. he ‘Three Room Dwelling’ Diorama is based on the events the happen Monday, November 1, 1937. This is one of the most disturbing Nutshell dioramas that depicts a three room space which the entire family had been slain. Robert Judson, a foreman in a shoe factory, his wife, Kate Judson, and their baby, Linda Mae Judson, were discovered dead by Paul Abbott, a neighbor. Mr. Abbott was question and gave the following statement: Bob Judson and he drove to their work together, alternating cars. This was Abbott’s week to drive. On Monday morning, November 1, he was late—about 7:35 a.m.—so, when blowing his horn didn’t bring Judson out, Abbott went to the factory without him, believing Judson would come in his own car. Sarah Abbott, Paul Abbott’s wife, was also questioned and gave the following statement: After Paul had left, she watched for Bob to come out. Finally, about 8:15 a.m., seeing no signs of activity at the Judson house, she went over toothier porch and tried the front door, but it was locked and she knocked and called but got no answer. She then went to the kitchen porch, but that door was also locked. 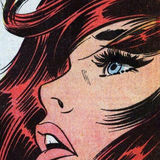 She looking in through the glass, and then, thoroughly aroused by the sight of the gun and blood, she ran home and notified the police. The model shows the premises just before Mrs. Abbott went to the house. Dawn broke at 5:00 a.m. Sunrise at 6:17 a.m. Weather clear. No lights were lighted in the house. Both outside doors were locked on the inside. New Hampshire’s White Mountains that Lee placed behind a faux window to create a scenic backdrop. The diorama depicts a fictitious farmer, “Eben Wallace,” found dead on July 15, 1939. His wife, “Imelda Wallace,” told police in an eight sentence statement that her husband was hard to get along with and would sometimes go to the barn to threaten suicide. He would stand on a bucket with a noose around his neck until she would persuade him to get down. On the day of his death, she had been using the bucket at the pump. Her husband had stood instead on the wooden crate. To see and learn more about Frances Glessner Lee and the Nutshell Studies of Unexplained Deaths come visit the Smithsonian Museum to get a closer look on the Nutshell Dioramas and figure out the clues behind these murders, suicides or accidental deaths.